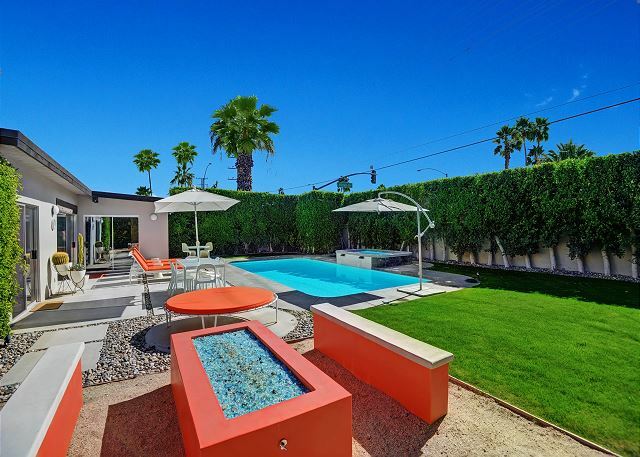 If you are searching for fun and relaxation in the Palm Springs sun, this is the house for you! 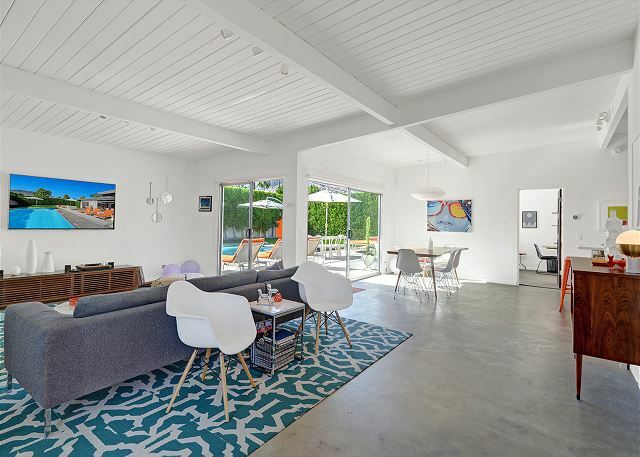 This property is an amazing remodel of a mid-century modern Meiselman home with all of the beautiful and hip features you'd expect, plus all of the most desirable amenities of a brand new home. 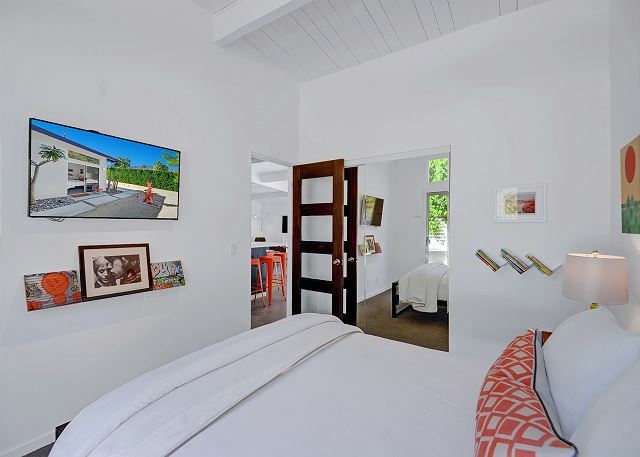 The master suite boasts a king size Tempurpedic mattress, en-suite bathroom with rain shower, and large sliding doors out to a private patio. 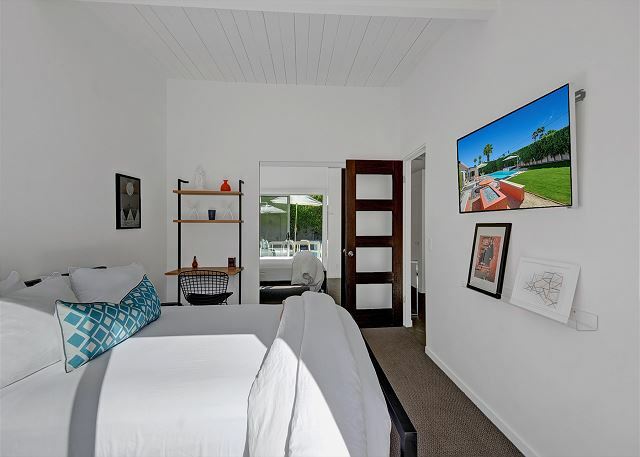 The two guest bedrooms have Posture-pedic queen beds with sliders to either a semi-private patio or to the pool side patio. 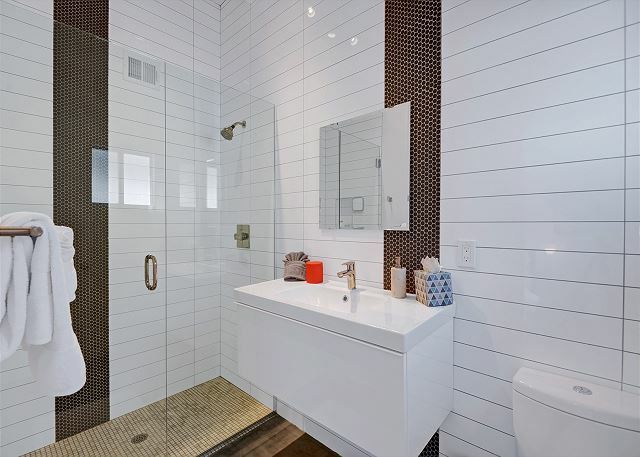 The guest bathroom is right off the two guest bedrooms and has a bathtub perfect for the little ones, and with on-demand hot water, you will never have to wait to take a shower! 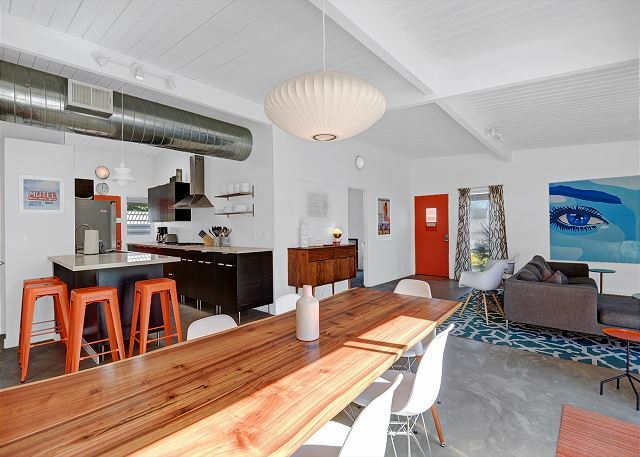 An open floor plan kitchen, dining and living room are perfect for entertaining and are furnished with vintage and modern designer pieces that will make your stay memorable and comfortable! 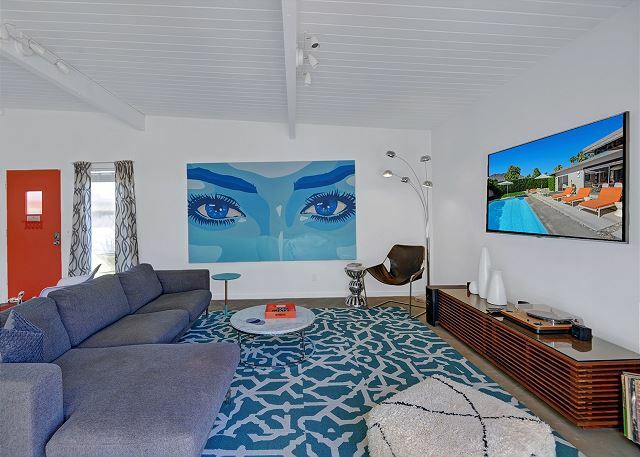 The living room is equipped with a 55' flatscreen smartTV with cable, wifi, and DVD player. 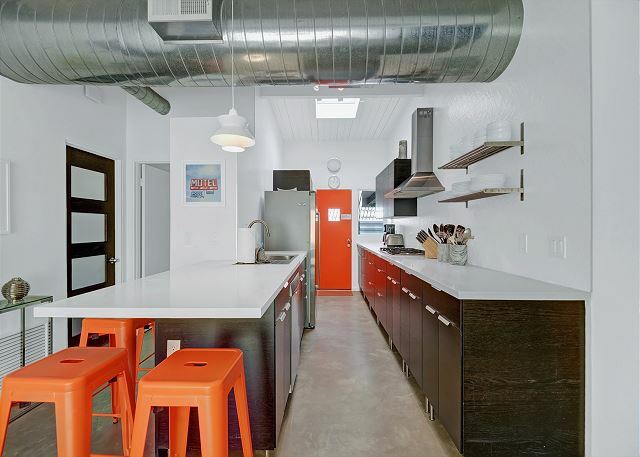 The kitchen is fully equipped with every possible amenity that will impress the most discriminating entertainer and cook. You will never have to say 'Oh, I wish I had brought ____ from home!'. 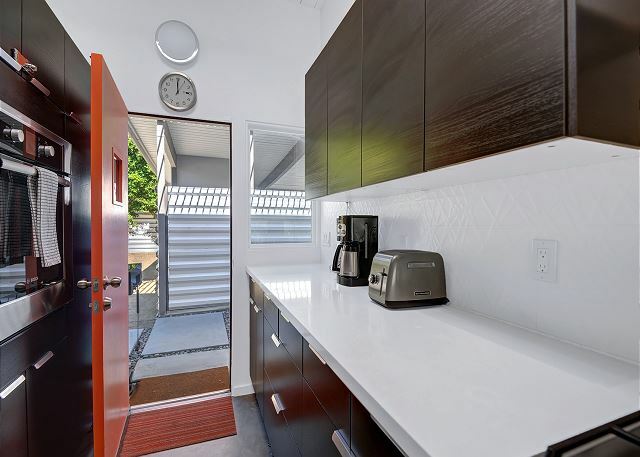 There is a gas range, electric oven, in-door filtered water and ice maker, ultra-quiet dishwasher, and counter space for days. 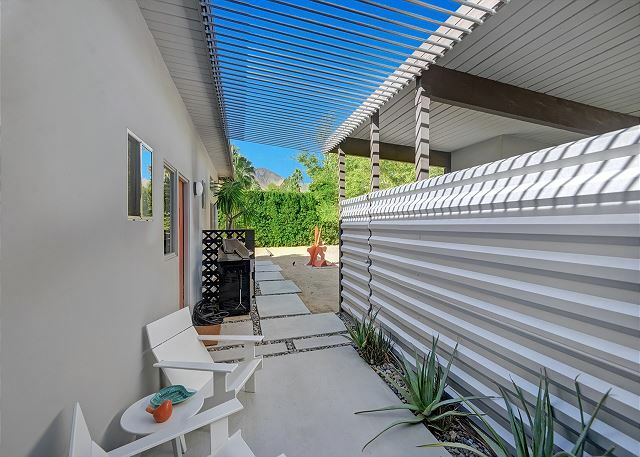 The dual sliding doors open to an amazing patio and 15' x 32' x 7 1/2' deep salt-water pool that gets sun from morning to evening, with a beautifully, fully integrated 5' x 8' 8 jet salt-water hot tub that seats 10 with gorgeous mountain views. For the bocce ball beginners or enthusiasts, you'll enjoy the backyard court where you can play in the sun in full view of the mountains. 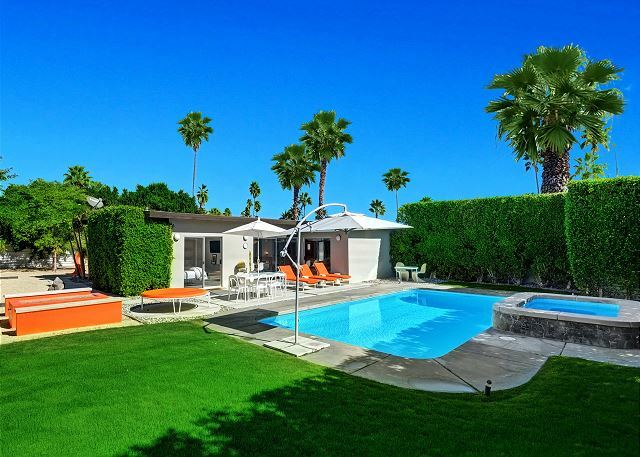 The house is situated in Central Palm Springs in the Sunrise Park neighborhood. 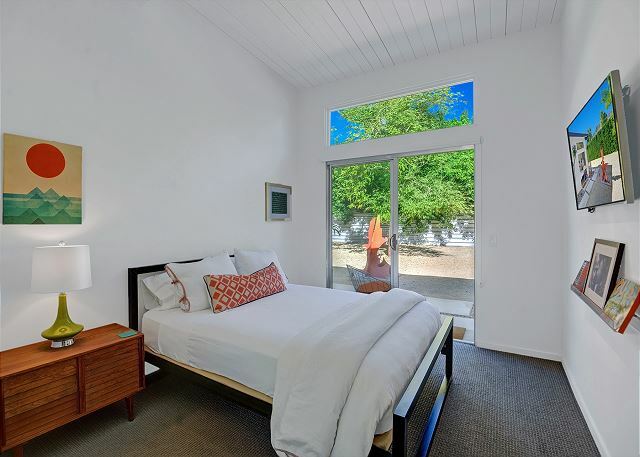 It's a quick jaunt into downtown and less than a mile from the Palm Springs Airport. Carport and driveway parking for up to four cars. Bring your sunscreen, your margarita recipe, and have a great time! 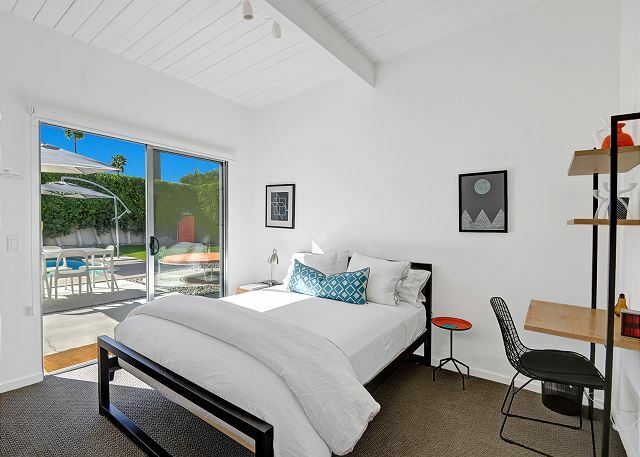 The property was in better condition than we could have expected, clean, and beautifully styled. ALSO the pool was actually heated to the perfect temp (if you have rented before you know that its a toss up if the pool heating actually works). ALSO ALSO they provided amazing linens and really great quality pillows. We had a great time staying here and were very close to restaurants and downtown. 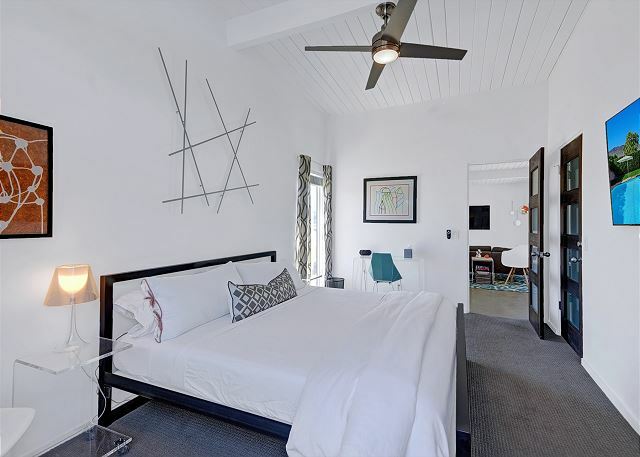 10/10 would stay here again and would recommend Altamira Vacation Rentals as well! Thanks so much! The location is fantastic. The yard is huge! Everything was really well thought out. We enjoyed lounging by the pool most of the day and hiking early in the mornings with our dogs. 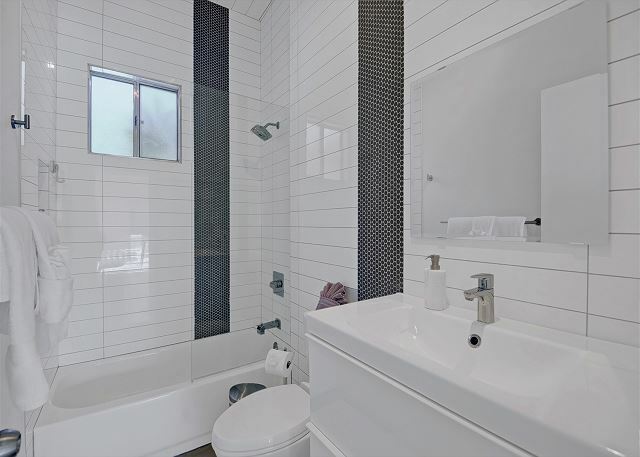 The place was clean and tidy and that property manager was easy to get a hold of when necessary. We brought some friends here for my fiance's birthday and had the time of our lives. Our pup enjoyed the yard, we played bocce, grilled, and lounged the days away. 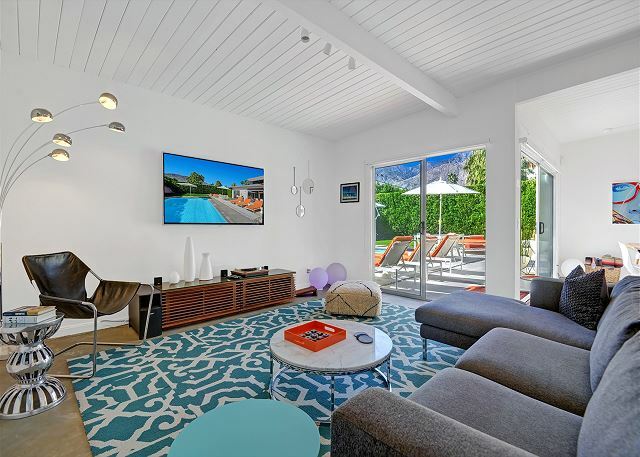 I was impressed with the fully stocked kitchen and entertainment systems available, apple tv, record player, etc- it was a great time and we would rent again for sure! Perfect house with all and more of the necessities you will need. 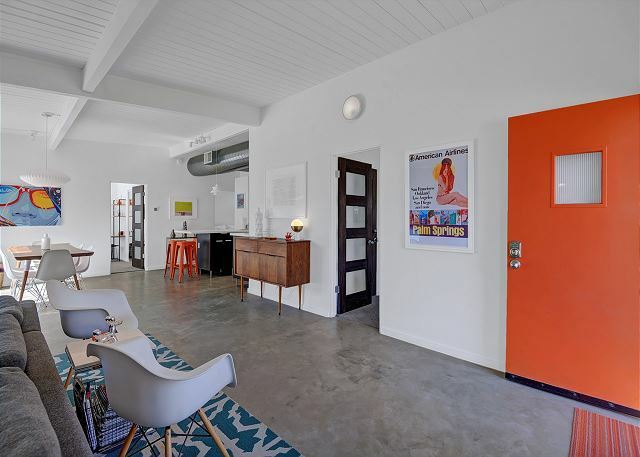 The mid mod feel was exactly as describe and what we were looking for. Easy access to everything...we will be back!!!! The property was just as advertised - very stylish and fun, as well as comfortable and immaculate! The management was extremely responsive and helpful. Highly recommend! 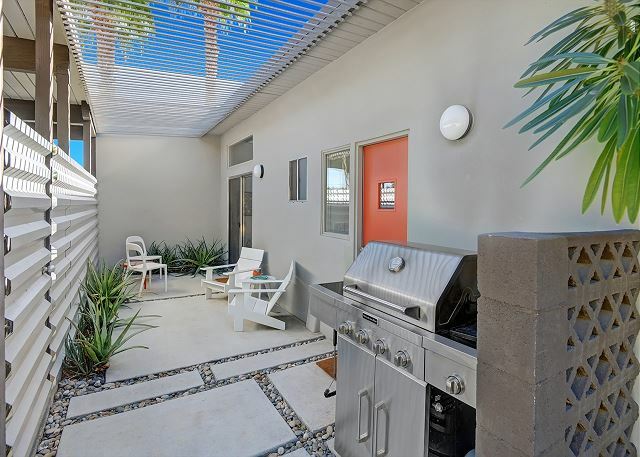 Great location close to everything you want to see and do in Palm Springs! Came for a complete relaxing getaway and that's exactly what we got! Super private and well kept property. I simply loved it . We enjoyed our stay at this house. It is well maintained and the host did an excellent job of attending to our needs. From the moment of booking to arriving every detail was handled in a timely manner and not one detail missed. The three gentlemen running the company have been more than friendly and professional. When arriving the home was spectacular and offered more than the photos. Our stay was relaxing because they thought of all the small details. Would come 100 times over. WEll DONE! 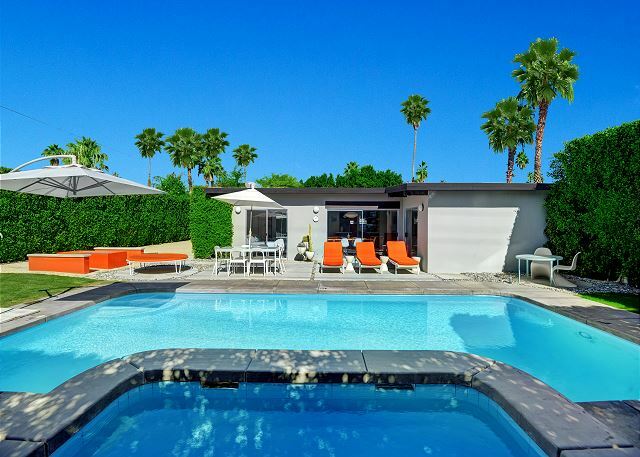 Best Palm Springs Getaway Ever! We absolutely loved our stay at Altamira. The property had everything you needed to have a great time. It was clean, inviting, comfy and fun. The owner provided great customer service and answered all of my questions via text which was so convenient! I would definitely recommend this place to all my friends and I can't wait to stay here again. We found the home to be very comfortable, clean, and well maintained. As it is located on a busy intersection and an emergency vehicle response route, traffic noise was a bit much. Property management responded very quickly to a couple of small items, and were very kind in allowing an early check in and late check out. The "rule book" was a bit off-putting at first, but I suppose there may be guests who might abuse things (we've rented a lot of properties, and hadn't ever seen such a comprehensive list of rules). All in all, a nice relaxing stay though. Thanks! We had a wonderful time at Modern Hideaway. The photos do it absolute justice. We are 6 in the family and we had ample room. The home is very clean and comfortable and with everything you would need in a home. Very well equipped. Easy to find, nice proximity to center of town. 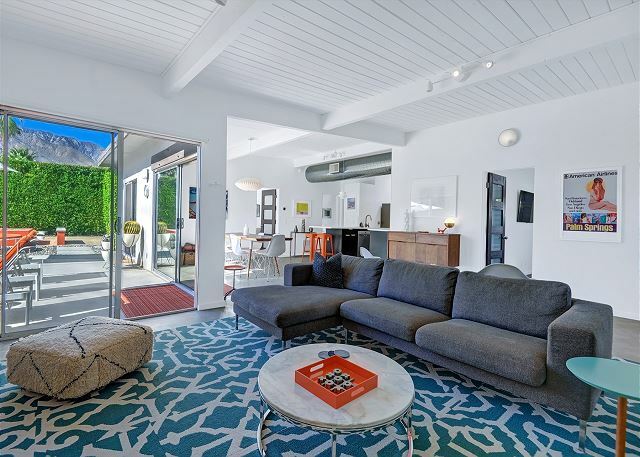 This is a beautiful house, artfully furnished and immaculately clean. We felt right at home immediately. Even though it is located near the airport on a relatively busy street, we never noticed any noise from passing cars or planes. We would stay here again in a heartbeat and are already looking at booking dates for next year. LOVED IT! 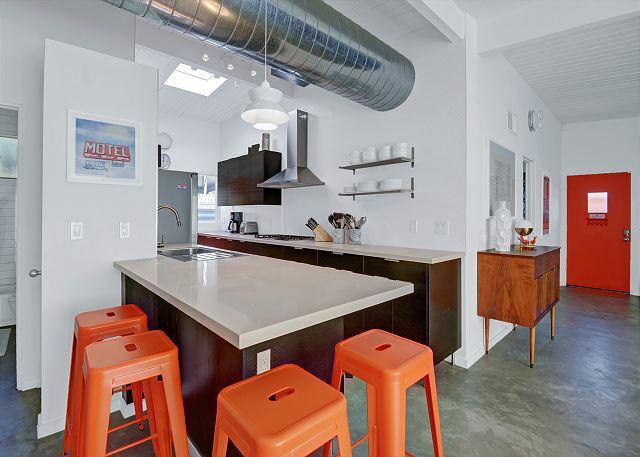 The kitchen and barbecue are fantastic, extremely well-stocked including a few basics. 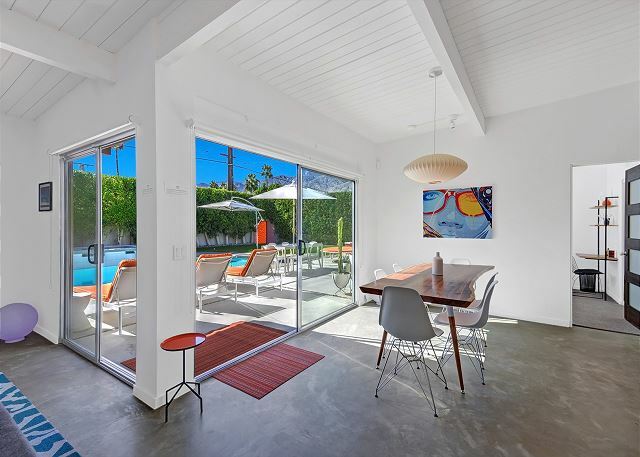 The pool and spa are lovely and the outdoor space is spacious and private. The rental contract scared the **** out of me. I waited to review because I was sure we wouldn't get our deposit back. It's not fun to constantly clean while you're on vacation, but kiddos and dogs get nose and fingerprints on things. I found it very stressful to have an infant here, but would be find for kids over 4. 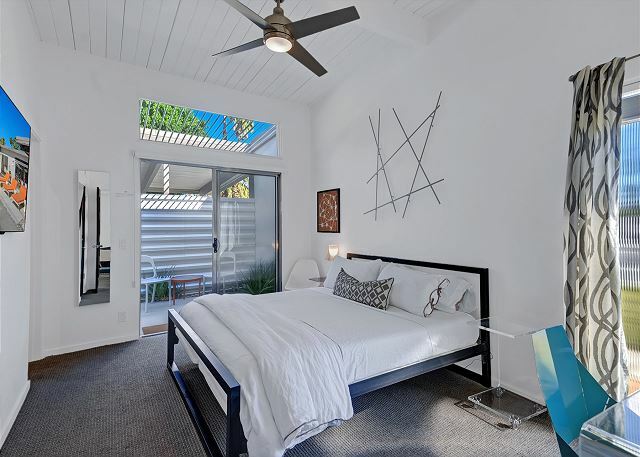 If you're going during the hot months, the master doesn't cool as well as the two smaller bedrooms. We ended up foregoing the tempur king mattress in favor of comfortable sleeping in another room, and I worked at the dining room table instead of the desk. A group of friends enjoying a birthday getaway weekend. This was home was perfect! We had a relaxing, enjoyable weekend. The home was comfortable and had all the amenities we needed to enjoy our stay. Rental process with Altamira was simple and easy. Michael was available and quickly return any calls. Looking forward to renting this home again in the near future. We really enjoyed our stay. It was perfect for 4 people (1 couple and 2 singles). The pool was awesome and great location. I first want to commend Michael on his wonderful service. The original house we reserved was having some issues, so he thoughtfully gave us an upgrade with the same rate. Everything about our stay was relaxing... The heated pool, outdoor fire pit, and super warm hot tub were awesome. We also appreciated that everything from the appliances to the serving ware were high end. I love when you stay somewhere that feels like a step up from your own home. It did not bother us much, but this house is on a busy street so was a bit noisy at times if you are looking for somewhere more remote. 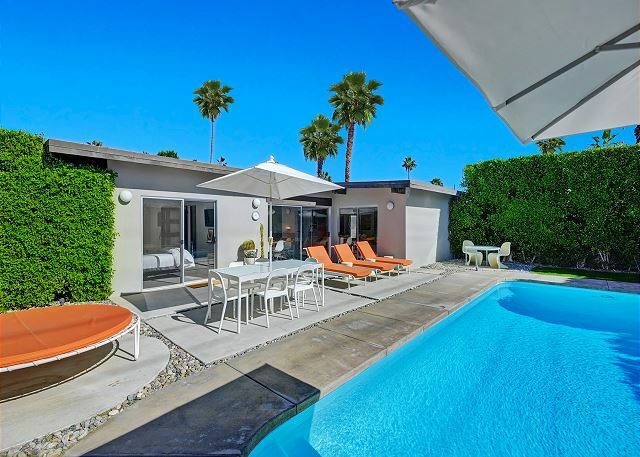 We rent houses in Palm Springs often and I will say this is definitely one of the best ones we have experienced. The details of this place were outstanding and we would love to come back soon! 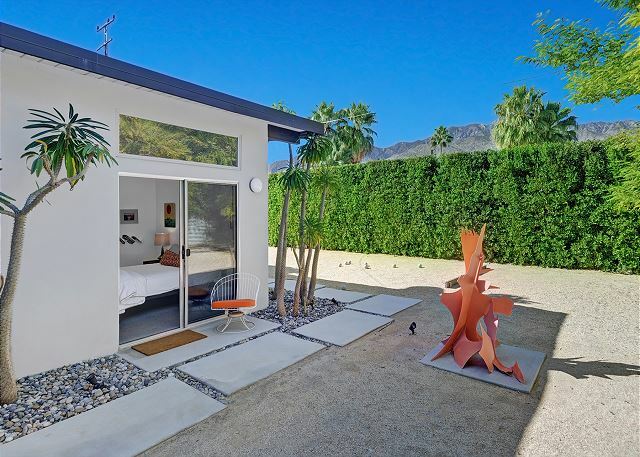 Great Modern house in Palm Springs by the airport. On a bigger street but the house is very well guarded by the surrounding trees. Everything you ever wanted in the house from board games to cocktail shakers. James was great to deal with and worked with us on changing the date and an early check-in. The house was in perfect condition. Exactly matches the existing description online. James was so accommodating with any questions we had. We all decided that we will be coming back again. It was perfect for the weekend and so spacious. We absolutely loved this house. It is great for both families and/or a friend's weekend. 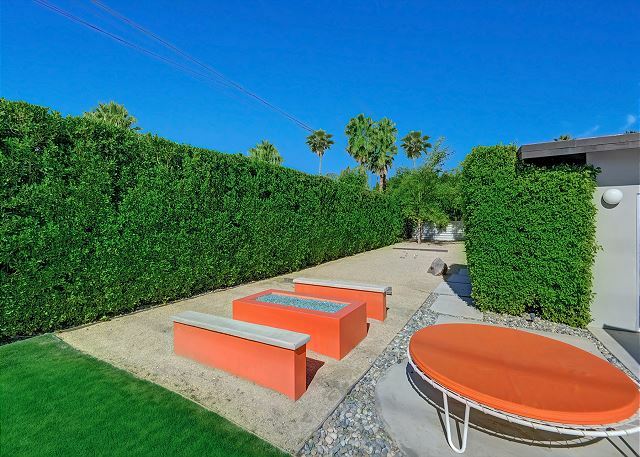 Plenty of amenities in the backyard for everyone to enjoy. 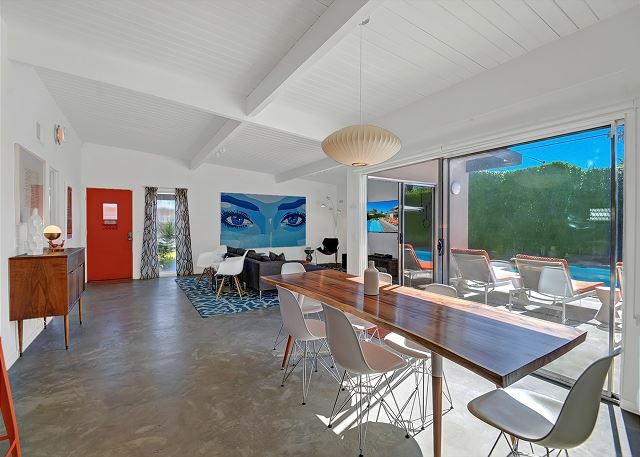 Property was well maintained and well stocked. Also, the management company was quick to respond, in person, with an issue we had with the jacuzzi. Overall, it was a great experience and I can't wait to book our next stay. Beautiful home close to downtown! "Modern Hideaway" definitely exceeded our expectations. 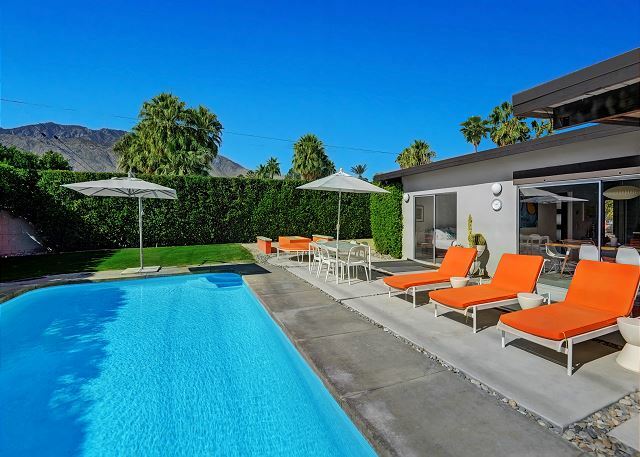 The home is really well done in the mid-century-chic style you expect from Palm Springs. The decor is high end and yet very comfortable. The layout is perfect for indoor/outdoor living. And my friends and I took full advantage - relaxing by the pool, playing bocce and roasting marshmallows at the fire pit. We did venture out for a cocktail one night and were really pleased to find we were only a 3 minute drive from downtown. All in all, this place was perfect for our long weekend!